One thing we know for sure is that outside of Darren McFadden there is no sure superstar in the bunch. However this class is a pretty deep one and teams looking for help at that position shouldn’t panic this season. Quality backs can be found this year as late as the 4th Round. This guy could be like Adrian Petersen was in his first season. McFadden is that good. He has speed, power and catches out of the backfield. However he does run a little bit straight up and he’ll have to fix that. He also had a few off the field issues so hopefully he will stay on the straight and narrow. Oakland should take him with the 4th overall pick. Two or Three other backs could be the next pick but I think Rashard will be the next best runner. He has a solid all-around game and tremendous drive. He is also a really good back out of the backfield. He could go as early as #13 to Carolina, #14 to Chicago or as late as #25 to Seattle. There will definitely be some teams looking to trade up to get him if Chicago and Carolina take a pass. Felix is more than likely going to go to a team that features tandem backs. He is known as a ‘home run hitter’ kind of a back. He could break one open but he could look really average too. He is an inside out runner with very little receiving skills. And there is no telling how much of his stats were in mop up time. However he performed well against some great run defenses (LSU 9 attempts 85 yards) and will get a look in the first round. Dallas may take him at #22 but if they pass on him there Seattle might nab him at #25. Stewart is a solid runner. He is built like a tank and has very good speed for his size. He is also a good blocker and receiver. His only downside is the competition he has faced. PAC-10 defenses (except for USC) are typically weak against the run. However Jon is a tough runner with a good all around game. He could sneak into the end of the 1st Round as a pick of the Packers or NY Giants. He may also slip as far as the NY Jets in the 2nd Round. Ray may end up being the most productive back of this draft. He is a three year starter that get better each year. He is a tough kid who fought through injuries. 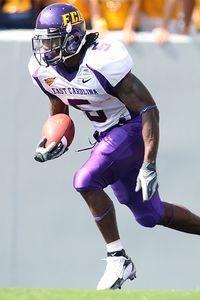 He also improved his overall game and became a very productive receiver in 2007. He also scored 24 TDs on the ground in 2007. Ray might go to his home town team the NY Jets in the 2nd Round but he could slip to the Bucs where he would fit in nicely with Warrick Dunn. You can’t help but think Jamaal is doomed because Texas backs have been a bust in the NFL. However he is a very fast runner. He appears to a be a Reggie Bush “all or nothing” kind of a player. If he bounces to the outside and has room he has a chance to take it to the house every single time. Unfortunately he is a little light and will have a hard time bouncing anywhere in the NFL. He also has issues fumbling and blocking. Jamaal will go to Seattle in Round 2 or he slips all the way to the Lions or Texans in Round 3. Kevin has scary potential. He rushed for over 2,5oo yards in only 14 games. That is unreal. He also had 242 yards receiving on the season. He has above average speed, quickness and hands. His downsides are minimal. He had some injuries in 2005 and 2006 and he probably needs to add 10 to 15 pounds to his frame. These should be huge issues and someone will find a great deal in Round 3. He should go to the Lions, Cardinals or Texans. Chris is a very fast running back. He also has great hands and is a threat on special teams. He is this year’s Devin Hester. But don’t get me wrong, he’ll never be Devin Hester. He is the closest thing to him in this draft though. He had a break out year in 2007 but really didn’t do much to impress before that. He probably ends up becoming a back-up, change of pace back and kick off return specialist. He is also a 3rd Round pick to either Arizona, Detroit or Houston. The one thing you can say about Mike Hart is he is a leader. He is also a solid 3 1/2 year performer (he was injured as a sophomore). There is no mystery to this pick. You are getting a kid that works hard, runs inside and out and will protect the ball. He is a little small so he will need to add a few pounds. He reminds me a little of Tim Biakabatuka. He will make a football team but he won’t be a starter. He could go in Round 3 to Detoit but he may slip to the end of that round to Chicago or Indianapolis. Steve probably cost himself a round or two by returning to school. His sophomore year was awesome and his junior year just OK. He does have great speed and is a very dangerous runner. He is also a fantastic receiver and some team might use him as a 3rd down back or in the slot. He would be a heck of a weapon for Peyton Manning and the Colts at the end of Round 3 but he might slip to a lucky team like Rams, Chiefs or Jets in Round 4. This year the NFL Draft offers teams a wide variety of quarterbacks. About 10 of them are NFL worthy however I don’t think there is a star in the bunch. Here are my top 10 QBs in this year’s draft. He is the best of a so-so group of QBs in this year’s draft. Matt will be a starter in the NFL but I don’t think he’ll ever be a star. He has a strong arm and accuracy but he will force passes and make stupid decisions. Athletically he is very solid. 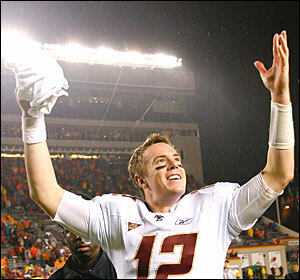 In my opinion he will look a lot like a young Drew Brees or current Rex Grossman. One minute he’ll set the world on fire and the next he is throwing 4 INTs. He will probably go to KC or Atlanta in the 1st Round. Brian may actually have more long term potential than Matt Ryan. He threw the ball over 470 times last season which is almost 40 attempts per season. He is really more of an old school QB that can sit in the pocket and tear apart a defense. The only problem is he can’t move very well. If his offensive line has any kinks in the armor he will be dubbed David Carr Part 2. Chicago needs a QB and may consider Brian but I think Detoit or Tampa will take a shot. Joe seems to have the total package. He is a winner, has a strong arm, great touch, awesome size and decent agility. What is the unknown with Joe? He is from Delaware, a smaller Div. IAA school. He has not played up to the level of comptetion his other QBs have and that will cause him to slide into Round 2. It think the biggest key is if a good team drafts him and he can sit on the bench a couple of years he will turn into a very solid starter. If a bad team takes him and he gets beat on his first few years than he may end up becoming a career back up. Could be Ben Roethlisberger or David Carr. Either way I think Atlanta or KC (the one that doesn’t get Ryan in R1) will take Flacco in Round 2. Chicago wants him but may have to settle for another QB later in the draft. You see Chad Henne and can’t help but think Tom Brady. He is smart, handsome and talented. He has the perfect size for an NFL QB. However he is a pocket QB all the way. He does not seem to play very well on the move. That being said if a good coach can teach him some foot work and how to move around the pocket a little better than Chad will become a solid NFL starter. If not he will get sacked…a lot. Chicago may take him in Round 2 but Baltimore may nab him before their pick. Tampa (if they pass on Brohm in R1) could also take him. Andre reminds me of Culpepper when he played at UCF. He is big, strong and has a good arm. He isn’t the most mobile QB but he could put his head down and pick up a short first down if he had two. The most important stat is that he took a non-winning football program and made them winners. He could end up being a solid starter in the NFL but his poor mechanics could bring him down. I can see Andre getting picked by the Panthers or 49ers in Round 3. How in the world can you look at 43 TDs and 1 INT as a senior and not be impressed. This kid is a West Coast offensive product all the way. He makes quick decisions and has above average mobility. Not to mention he is a good kid and leader. The only strikes against him are his level of competition and his slight build. If a quality NFL team and coaching staff can take time bringing him along and adding 10 to 20 pounds to his frame he will be a solid starter or coveted back up for many years. I think San Francisco will give him a long look in Round 3 as will the Chicago Bears with their second 3rd Round pick if they are still QBless. Colt has the potential to be the best QB in this class. He has an above average arm and threw 96 TDs in 2 seasons. You can’t ignore that no matter how badly he did in the Sugar Bowl. Hawaii really seemed to rally around him and he was quite the leader on this squad. Right now attitude, conduct issues and a bad bowl game took him from a late Round 1 prospect to a Round 4 gamble. I can see the “Big Tuna” take a shot on him down in Miami with their Round 4 pick. The Rams need an heir apparent to Bulger and they could take Colt in Round 4 as well. I am not sure how John David Booty slides out of the first day after that impressive Rose Bowl but he will. He lacks arm strength. He has been very difficult to evaluate because he is surrounded by so much NFL quality talent at USC. At best he is an efficient, starting West Coast QB and at worst he is a 2nd string game manager. I think Carolina or Detroit will take a shot on him in Round 4. If it wasn’t for the terrible knee injury Dixon suffered half way through the season he would have been picked in the 2nd Round. He is very much like a Vince Young. He has a very strong arm, moves around the pocket well and is tough to bring down if he decides to run. The injury will effect where he is drafted because it was such a key component of his game. He is also considering a career in MLB. I see Minnesota, Jacksonville or Green Bay taking a shot on him late in Round 4.